iRujulHRMS automates the attendance processes by generating log files for all employees. The log files keep track of your employees, when they come in, go out and when they take breaks. The records of daily/monthly attendance are taken from third party logging systems integrated with all consistency. Easily transfers the attendance records to admin, leave and payroll modules, minimizing manual reconciliation of employee payrolls. Also, allows you to create shifts and assign them to branch, department or employees. Categorization of workforce working overtime, from home, outdoor visits, and early leaves. Employers can update leave policies, set new rules & criteria for eligibility of different types of leaves and approval systems. Allows employees to access the information about leave details, including leave balances, leave history and earnings. Thus, eliminating confusions and potential conflicts. And the comprehensive reports gives you the complete history of leave usage for each employee. Easy to configure & track. Leave encashment and carry forward. Know your bench strength and plan accordingly. Effective insights to employee leave reports. No loss in pay calculation. It is an integral yet dependent part of any HRMS software. In iRujulHRMS you get a rule based payroll system which automates the entire payroll processing & calculations for net & gross, income tax, pf, incentives, loans and much more. We understand even a silly mistake in payroll may give a severe fall in the employees count. And thus, iRujulHRMS cuts down the older form of manual errors and provides accurate & efficient data as personalized for your company salary structures. Print and Email Pay slips to employees. Calculations based on user defined formulae. Track all payments for financial records. Generate and confirm your Payrolls. Includes increments, travel, arrears and much more. Allow your employees to reach you, access real time information and handle requests & approvals with ease. Keeps your employee informed and updated about their Position, Performance, Projects and Pay scale. It reduces overhead of your HR Personnel and provides a modern way to get smarter insights of employee collaboration and activities in the organization. This module helps recruiters manage the candidate information & their journey from application to appointment. The actual hiring process goes slow with the flow of requirement and thus, maintaining interview candidate records is of prime importance for best talent acquisition. Streamlining the process includes setting up human resource panel, automating tasks, sending alerts & communications, scheduling and tracking interviews and iRujulHRMS exactly do all this for you in just few clicks. Interview feedbacks are kept as centralized repository for all panel members to reduce the bottlenecks & progress the application faster. Post the job as the need arise. Analyze and Screen candidate applications. Schedule and Track Interviews through stages. Thorough & Precise Reporting with Analytics. Employee contributes the most in the success and standing of any company. Thus, it becomes very important to recognize the best contributors and reward them on time. A study says, the happy and motivated your employees are, the best they gives in sculpturing the organization. Regular evaluation of the employee performances requires adequate systems which can set goals and monitor them as well. Define Measurable & Attainable Goals. Create KRA, KPI & Competencies. Assign & Monitor Employee Performance. Requisition feature allows employees to raise queries and issues related to HR, Accounts, Admin or IT (network). Thus, acting as Help Desk center for in house work. The centralized system brings transparency to the resolution process and help monitor the overall work progress with respect to issues. Procurement keeps track of all the materials which are purchased and assigned to the employees. 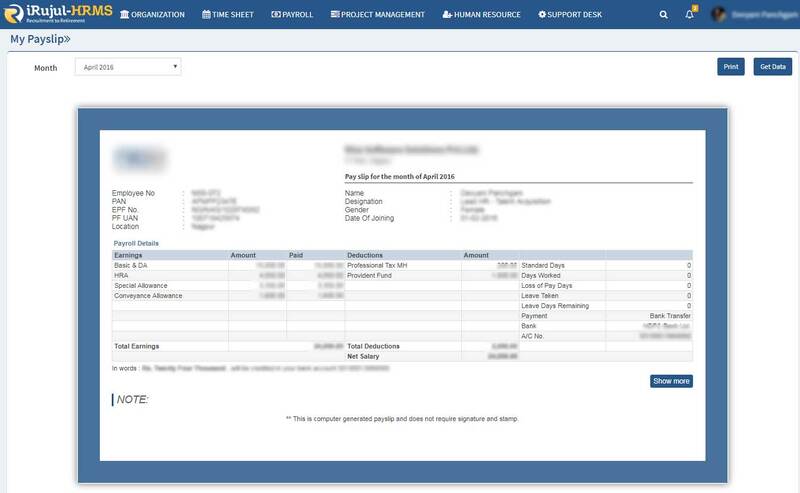 This feature records materials purchased as assets and assign these assets to respective employees upon request. Employees can further return these materials to admin, after completing their usage. Knowledge Base act as a storage unit for the materials and documents which are shared among employees. The main purpose of this feature is to keep every employee informed with official updates announcements in the form of written documents which are made available globally. For companies dealing in Projects and Assignments, it requires to keep track of their activities and relative information. Thus, Project Management helps in managing and assigning tasks to respective expert resources, Identify resource availability and track project status. This module gives input to the employee performance evaluation feature where the tasks and activities clearly describes a person’s contribution in the assigned work.